Just a brief note: our forelimb kinematics research on lizards and mammals is off and running (pun intended) in the BFF Locomotion Lab. This semester, several teams of undergrads from biology and physics are working with myself and Dr. Jason Shulman (Physics) on a variety of projects to explore the typical range of motion and posture in lizard and mammal forelimbs. 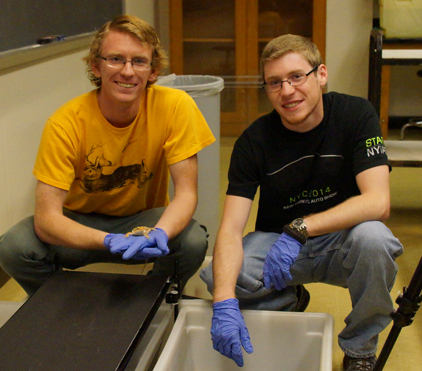 Corey Barnes (left) and Alex Lauffer are working with bearded dragon lizards to determine the typical range of motion in their forelimbs. 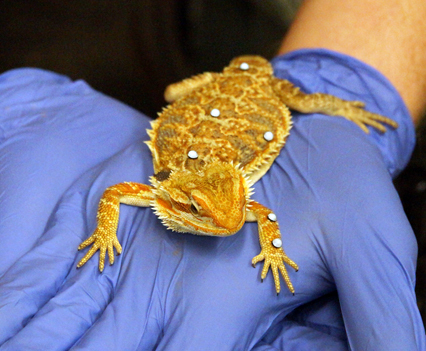 A close up of one of our bearded dragons, decked out with optical tracking markers. 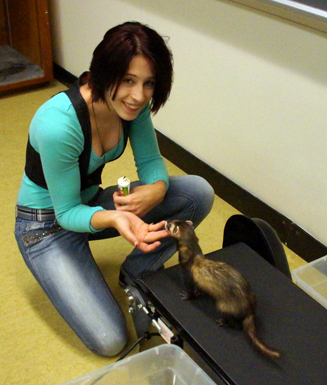 Undergrad Bridget Kuhlman coaxing one of our ferrets, “Mocha,” with ferret treats to walk on the treadmill. The BFF Lab is thriving thanks to the help of NAMS lab staff. We particularly want to thank Justine Ciraolo, Chrissy Schairer, Bill Harron, Mike Farrell, and Mike Santoro for their invaluable help in acquiring lab space and with technical assistance, and Deanne Gipple for help with student safety and animal welfare training. None of this would occur without the assistance and animal care provided by John Rokita and the animal lab staff and volunteers. We also thank NAMS Dean Dennis Weiss and the Biology and Physics programs for their continued support and assistance with our research endeavors. Finally, we give a special “shout out” to the Stockton Federation of Teachers for their strong encouragement of faculty research “without walls.” Thanks everyone! This brief post is to notify students, faculty, and all of those interested that the NAMS Research Symposium Abstracts and Poster Numbers have now been published on this blog. Again, the NAMS Research Symposium will be held on April 19, 2013, from 3-5 PM in the atrium between the C&D wings. For students and faculty involved in presenting research: follow the link to the on-line NAMS Research Symposium abstracts and locate the number of your poster. Posters are listed in alphabetical order by the first author. There will be numbers posted in the Atrium between the C&D wings on Friday, April 19, by 11:00 AM. From 11:00 AM to 2:50 PM, students should hang their posters under their designated poster number. Drs. Tara Luke and Matthew Bonnan will be available during these times to assist students with setting up their posters. Given that we have 46 presentations, please make sure that you place your poster under the correct number that you have been assigned. Thanks to all the students and faculty for submitting so many interesting research abstracts, and we invite the Stockton community and anyone else who can attend to come and see this work.